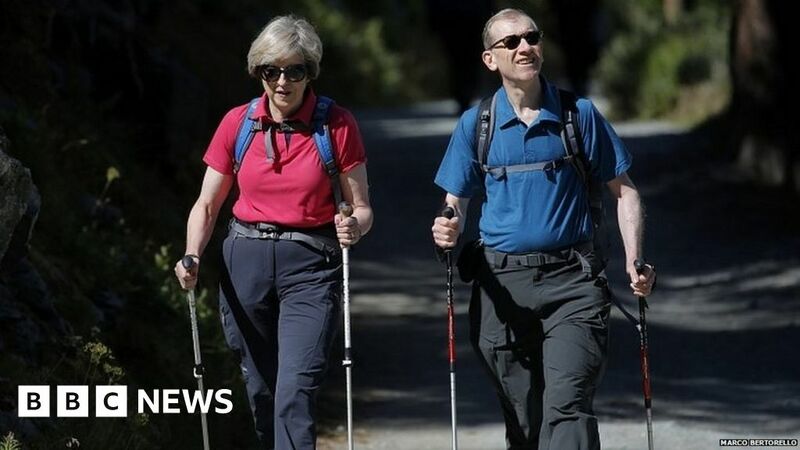 Theresa May is spending part of her Easter break on a walking holiday in Wales, Downing Street has said. But – stand down everyone – Number 10 has insisted the prime minister is not considering calling a general election. Mrs May famously decided to call a snap election during a walking holiday in Snowdonia in 2017 and went on to see her Commons majority wiped out. She has previously said she loves going to north Wales with her husband Philip “because the scenery’s great”. The parliamentary Easter recess comes at a turbulent time in politics, with Brexit deadlocked in Parliament and no resolution – yet – from talks between the government and Labour. Last week, the EU extended the Brexit deadline to 31 October, prompting calls from several Conservative MPs for the prime minister to stand down before the summer. Before the cross-party talks began, Mrs May faced calls from Labour leader Jeremy Corbyn to call a general election to break the Brexit deadlock. Downing Street said the prime minister, who survived a confidence vote of her own MPs in December, began her holiday on Saturday and no further details were given. In April 2017, as Britain went back to work on the day after Easter Monday, Mrs May stood on the steps of Downing Street to deliver her surprise call for an election. At the time, she told ITV News she had thought “long and hard” about the matter while relaxing in Snowdonia. Talking more recently about her fondness for north Wales, she said she and Philip “love going there because the scenery’s great, the hospitality is great, we get a great welcome there and it’s a wonderful part of the country”. Meanwhile, Mr Corbyn has been pictured taking part in a range of recreational activities during a visit to a youth activity centre in Calderdale, West Yorkshire. The Labour leader had a go at archery and tried a canoe out for size, although he was there ostensibly to highlight cuts to youth services. Ahead of the visit, he said these services play an “absolutely vital role in our communities” but austerity is pushing them “to the brink”. Mr Corbyn has previously said Britain is in “limbo” with “deep uncertainly” for businesses and workers over the government’s handling of Brexit.